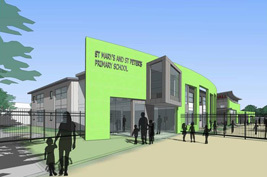 William Martin are acting as CDM Coordinators on this £4.5m project to expand St Mary’s & St Peter’s Primary School from two to three forms of entry. The aims of this project are to provide well planned accommodation for the additional teaching space, specialist areas and associated non-teaching and administration areas to meet current DSCF standards. Enable the new and adapted accommodation to be constructed without causing significant disruption to the operation and safety of the school. Achieve a BREEAM ‘Excellent’ rating.